I just recently bought a work bag since the tote I had was just not cutting it. My biggest annoyance with the tote was that it was completely unstructured and lacked a cross-body shoulder strap. For those of you who commute to work in a car, you're one of the lucky ones who can pretty much wear any bag they want. For the unlucky ones (like me) who have to commute using public transportation, we need a bag that would make the morning commute more bearable. The most important features when I was shopping for a work bag was size, structure, and security. Size wise is like Goldilocks and the Three bears - you need a bag that is just right in terms of size depending on how much you carry to work. A work bag also needs to be somewhat structured especially if you're going to be holding it on a commute or carrying documents in it. Lastly, security is highly important since it keeps your valuables safe, but it also makes your life easier when you're standing on the subway. All the bags below have either a cross-body shoulder strap or the handles are generous enough so that it won't slip and slide while on your shoulder. I included two "blackpack" purses because I think the recent back-purses look chic and more dressed up than your normal canvas backpacks. 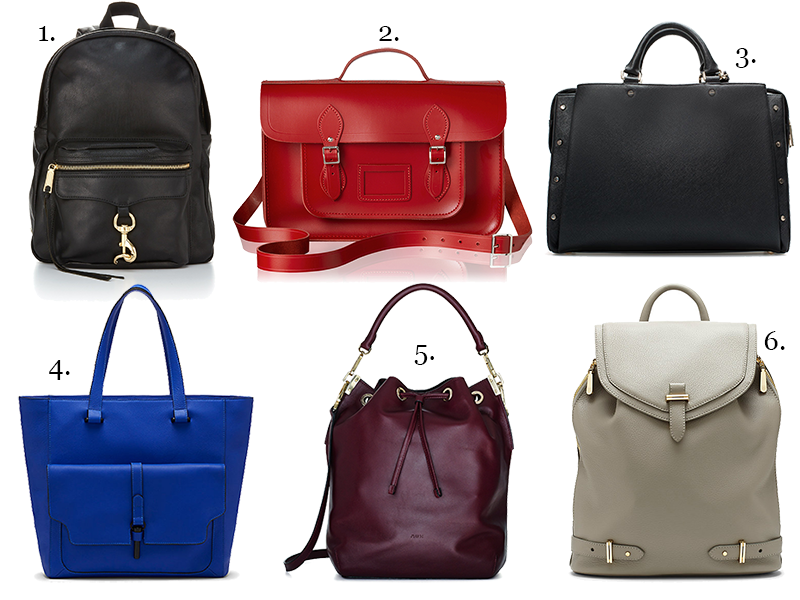 Plus, they're different from all the satchels and totes that a lot of other women defer to. I also tried to choose styles that are different from the popular professional purses (such as the Tory Burch Robinson tote or the Michael Kors carry-all tote). Oooh I love the "blackpack" purses!! I hope you'll do a post on work bags that fit legal size papers and redwelds.. or work bags that are made to carry laptops! I like the backpack purses too! They're different but stylish. I think the red cambridge satchel featured above can fit legal sized papers!